It’s not entirely your fault if you are overweight and have problem keeping it off. Eating the wrong type of food will trigger your cravings and hunger pangs. And most of the time, you do not realise it. “You are fat for one reason and one reason only,” he continued. “You eat like a pig. 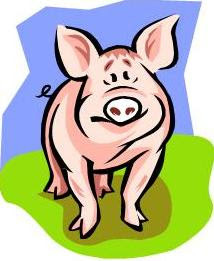 You look like a pig because you eat like a pig and you will continue to look like a pig until you stop eating like a pig. Your blood pressure is at stroke level. Your triglycerides are twice normal. Your knees are collapsing from the burden of carrying all of that weight around. If you look like this at forty, can you imagine what you’ll look like in twenty years? That patient, Dr Rachael Heller, finally figured out that her constant hunger was due to carbohydrate addiction. She then ate correctly and stop craving for food. She dropped to her current slim form and co wrote of The Carbohydrate Addict’s Lifespan Programme. The book was listed as the New York Time’s bestseller. If you want to read more, I recommend that you get a copy of the book. If you cannot afford the first hand, you can look out for Pay Less Book’s next warehouse sale. He pursed his mouth in disgust and handed- no, threw- to me a sheet of paper detailing the food exchanges allowed on his one-size-fits-all weight loss regimen. “Follow that and you’ll lose weight,” he concluded as he handled me the printed diet. “Don’t and you’ll keep gaining weight- till you blow up or drop dead,” he added coldly. And without another word, he rose and left. Sadly many people had the misconception that fat or overweight people are lazy, weak willed and unable to control their food intake. These people normally grew up being overweight because of eating the wrong type of food- junk food, fast food, sweets, processed food- that you typically find the modern world. As the result, they develop a sort of carbohydrate or sugar addiction- it’s mostly biological. Everytime they eat refined carbs (in white flour) or table sugar, their body releases too much insulin to bring down the blood sugar in the blood. As the result, their blood sugar levels dropped rapidly and another signal is passed over to their brain that they’re hungry. Even though they had just eaten a full meal less than 1/2 hour ago. As it is not real hunger, their body will either crave for something sweet or salty. If a cup of oats or some wholesome food is put in front of them, they do not have the urge to eat it. It’s always craving for some candy bar, chocolates, chips- something totally rich in fat or sweet. If the condition goes on, the person will almost certainly get diabetes later on. Each time we crave for something, there’s only a limit to fighting it off and telling ourselves NO. Our brains work very fast and in a split second, many thoughts had rise and fall away. In two hours, you will have told yourself that you must not eat that cake, even though you want to very badly. And by the time it was the 201th time, you would have reach your endurance limit. What the heck, just eat it and get it over with, right? Imagine having to deal with telling ourselves NO or that we’re bad so many times of the day. Honestly, this will test the willpower of a saint. That’s why, it’s not entirely the person’s fault for wanting to eat. Sugar/carbohydrate addiction is real. I know because I also suffer from this and learned to find a way to solve it. understand your food triggers- sugar, white flour and starchy stuff- try your best to avoid or eliminate them. exercise- it helps to normalise your insulin levels. Many studies published had confirmed this. Combined with the right food choices, you will suffer from less food cravings. As I mentioned in my previous posts, I’ve experienced an increase in food cravings right after lunch till right before dinner these few weeks. I had this problem since childhood. But few months ago, I had minimize table sugar, cut off white flour and starch from my diet and the cravings stopped. Later, I slowly weaned back to a bit of noodles and later white bread. Still, the exercising helped and I find the food cravings were there but controllable. It’s only when I started buying tea with evaporated milk (I come back and add a little sugar), I find my food cravings getting worse. Even my colleague commented that I am eating more sweet stuff nowadays. But I am not worried about the cravings because it know its cause. I just removed the triggers and the problem will be solved. Since yesterday, I cut off table sugar, starch and white flour from my diet. Without processed carbs (I still take lots of fruits), the amount of food I am eating is very much less. Like for dinner today I only had a bowl of soup with vege, mushrooms, 2 small fish balls and a fried chicken (not coated with flour). The chicken was fried, then placed in the oven to roast and drain out the oil. I felt very full after the meal, minus the sickening bloating feeling that I get if I were to eat a huge plate of chicken rice or nasi lemak. Then, I flipped the newspaper and saw articles on cupcakes and crispy apom balik (I love apom balik with peanuts, margarine and coconut), I feel like going the night market and getting some. But I decided to just take a small drink of Milo (1/3 of a packet) and felt no further cravings. In the past, my cravings will not rest till I really eat something rich and high in calories. When we start our day, we must make sure we eat right. Then, the rest of the day will be ok. Start the day with some white bread sandwiches or some cakes, and your whole day will be spent craving for more. Once you identify and control your food triggers, you cravings to indulge will be very much reduced. The question is, are you willing to make a change in your eating habits? Stopping food triggers involved giving up lots of your favourite food. You have to want it in your heart before you can give up. But once you give up, you’ll get a quality of life: energy, vitality, self confidence, able to fit into tighter clothes. No matter how many times someone can tell you, you must experience it yourself to understand. Trust me, it’s REALLY worth it.